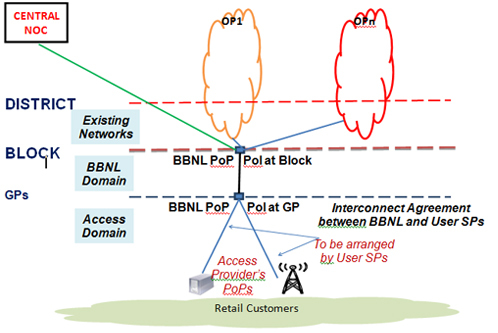 Bharat Broadband Network Limited (BBNL), is a Special Purpose Vehicle (SPV), set up by the Government of India for the Establishment, Management and Operation of NOFN. BBNL has been incorporated as a Public Sector Undertaking(PSU)/ Company under Companies Act(1956). BBNL was incorporated on 25th February 2012. Government of India has approved on 25-10-2011 the setting up of National Optical Fiber Network (NOFN) to provide connectivity to all the 2,50,000 Gram Panchayats(GPs) in the country. This would ensure broadband connectivity with adequate bandwidth. This is to be achieved utilizing the existing optical fiber and extending it to the Gram Panchayats. BSNL, RailTel and PGCIL have been assigned the execution work by BBNL.BSNL, RailTel, PGCIL, C-DOT, TCIL and NIC are working with BBNL on the NOFN Project. The funding of the project is from USOF.